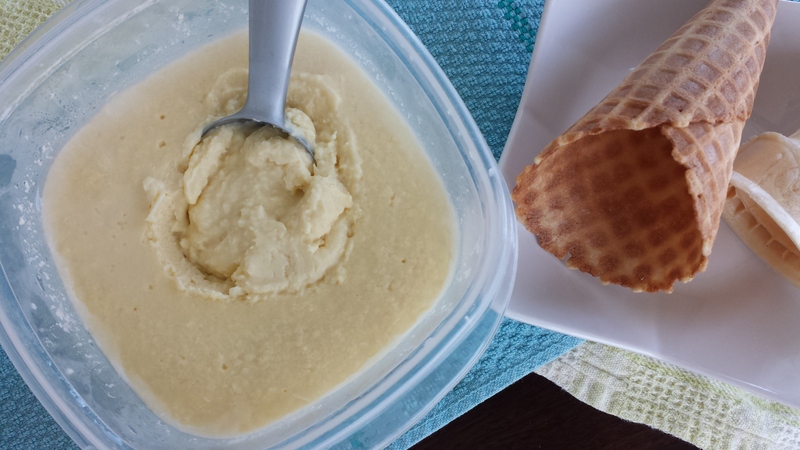 Cool off this summer with custard ice cream. Here’s a recipe for homemade custard ice cream to make the night before serving or early in the morning. This recipe makes 4-6 servings for cones or cups. Optional: Add chocolate chips, fresh peaches, crushed candy bars, crushed pecans or almonds or syrups for more flavors before freezing. Mix egg yolks and sugar together in a sauce pan. Add milk, heavy cream and vanilla. Stir and cook custard mixture over low to low medium heat until well blended. Cook and stir custard mixture until it boils for less than a minute. Remove cooked custard from stove. Pour into a plastic 32-ounce container. Cool down container with custard in an ice bath for 10 minutes. Cover and freeze 7-8 hours or overnight before serving. This entry was posted in Recipes and tagged Custard Ice Cream. Bookmark the permalink.